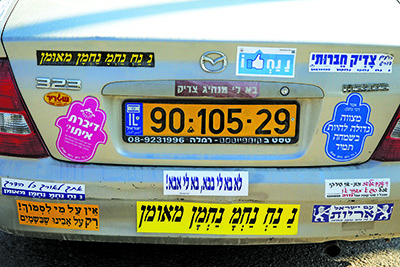 In Israel, at election time, bumper stickers—from the ridiculous to the truly sublime—appear in profusion. Stickerim is the popular “Hebrew” word for this Israeli way of airing one’s opinion. Israel’s Academy of the Hebrew Language reminds us that there are perfectly suitable Hebrew alternatives derived from the root ד–ב–ק (dalet, vet, kof), to glue. Take, for example, מַדְבֵּקָה (madbekah) and תַּדְבִּיק (tadbik)—both mean gummed label—which lead to דִבְקִית (divkit), sticker. The spectrum of phrases derived from our root includes דְּבֵקוּת (devekut), devotedness, the soul-grabbing enthusiasm one displays in prayer, as well as the “sticky-fingered” phrase דָבֵק‭ ‬בְּיָדוֹ (davek be-yado), literally, “it sticks to his hands,” referring to robbery. As we can see, the root has the advantage of adding to the discussion some wide-ranging cultural commentary. The root is found multiple times in the story of Ruth, who is called by the rabbis הַדְּבוּקָה (ha-devukah), the one who became attached to the Jewish people. After the death of Naomi’s sons, one daughter-in-law separates herself from Naomi, while Ruth דָבְקָה‭ ‬בָּהּ (davka ba), clung to her. Back in Bethlehem, kindhearted Boaz invites a destitute Ruth to glean from his fields, suggesting,‭ ‬תִדְבָּקִין‭ ‬עִם‭ ‬נַעֲרֹתָי (tidbakin im na’arotai), “stick with my girls.” In a less glorious incident described in the Bible, namely the death of King Saul, the prophet Samuel recounts the story of the Philistines who—giving the root two meanings—וַיִּדְבְּקוּ…אֶת‭ ‬שָׁאוּל (va-yidbeku…et sha’ul), both pursued and caught Saul. The noun דֶבֶק (devek) means glue, except when it doesn’t. Sometimes it refers to a nudnik (who gets on another’s nerves and won’t let go) or, alluding to davak in the story of the creation of woman, to a prospective groom. The term דִיבּוּק (dibbuk), incubus, calls to mind the play by Yiddish play-wright S. Ansky that tells of a demon that clings to the soul of a suffering bride. Joseph Lowin is the author of the recent book, Art and the Artist in the Contemporary Israeli Novel, a study of eight Israeli masterpieces.